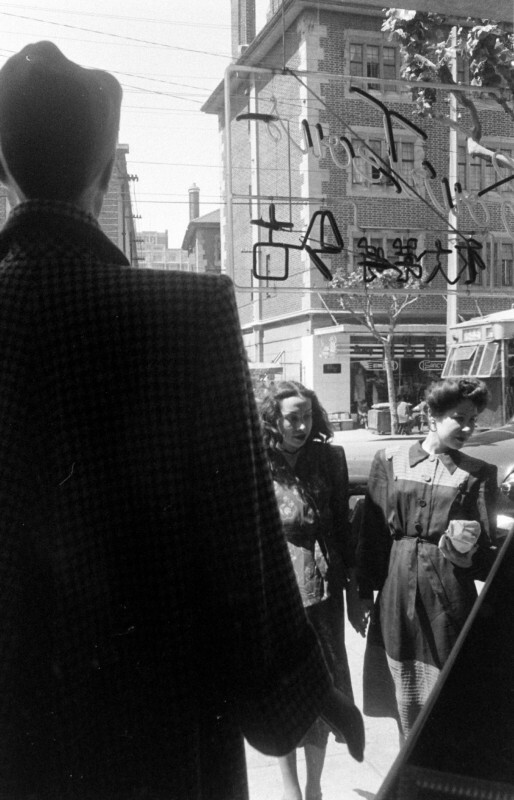 Out on Avenue Joffre, where highways of the world cross, where Shanghai's smartest stores and shops blend into a confusion of old Moscow, Paris, Berlin, New York, Bombay and Cairo, Shanghai's thoughtful and economical shoppers find bargains that make the so-called "High Cost of Living" a mere myth. Ask the pennywise shopper where the weekly bargains are to be found, and the answer is "Avenue Joffre." Visit these stores advertised on this page, and see for yourself that high quality goods are purchasable at remarkably low prices. V. Dookin & Company will fit you with corsets that will lend grace and youthful lines to your figure, while silks, fresh in texture and fresh in design, are offered by the Novelty Silk Studio. 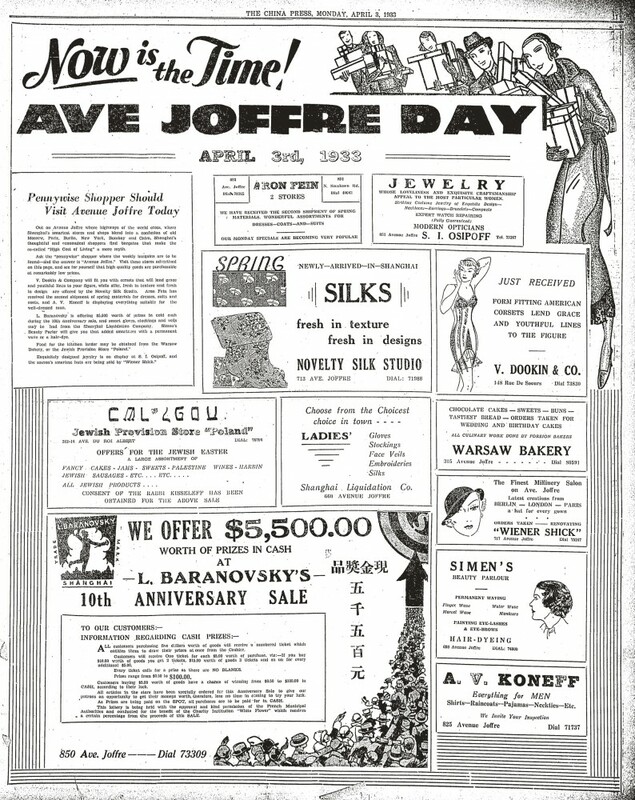 Aron Fein has received the second shipment of spring materials for dresses, suits and coats, and A. V. Koneff is displaying everything suitable for the well-dressed man. L. Baranovsky is offering $5,500 worth of prizes in cold cash during the 10th anniversary sale, and smart gloves, stockings and veils may be had from the Shanghai Liquidation Company. Simen's Beauty Parlor will give you that added smartness with a permanent wave or a hair-dye. Food for the kitchen larder may be obtained from the Warsaw Bakery, or the Jewish provision store Poland. Exquisitely designed jewelry is on display at S. I. Osipoff, and the season's smartest hats are being sold by Wiener Shick. 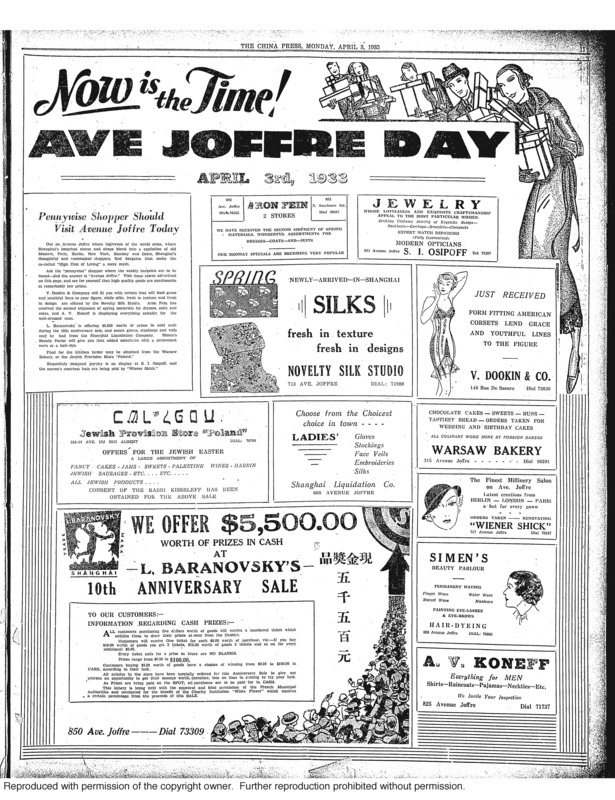 - A. V. Koneff's men's fashion store; 825 Avenue Joffre.